So hopefully someone can tell me what I need to do for this setup. We had our house wired, and while that's been great there's been a niggling problem with our Plex server and our desktops. Our desktops live upstairs and are connected via wired connections to the WiFi adapter. The WiFi adapter is connected via a wired connection to the ISP modem/router. Our Plex server (which also doubles as a living room computer) is connected directly to the ISP modem/router as that was the easiest configuration to achieve with the layout of our house. See below for a diagram. Unfortunately this means that our wireless devices and desktops can't see the Plex server, which means we can't manage it remotely if we're upstairs or want to push photos or other media to the server. We have to use sneakernet, which while faster is much less convenient when we typically pull pictures from devices on our desktops. 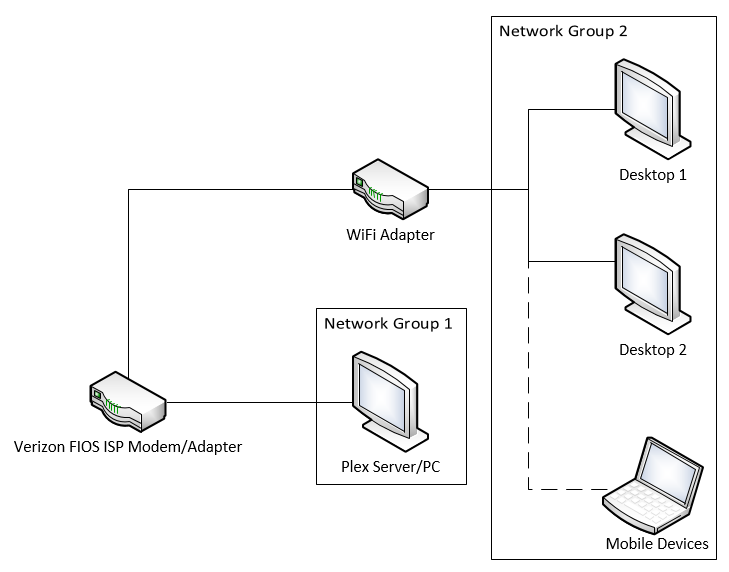 What I'd like to do is to get the Plex server into the same network group as the other machines, so that our network looks like the following. Connecting the Plex server directly to the WiFi adapter is not an option, nor is moving everything down to the ISP modem. We need to maintain the current wiring layout, but get them all to play nicely with each other. Browse other questions tagged networking wireless-networking router wireless-router or ask your own question. Wifi shuts down for everyone when going to another room? 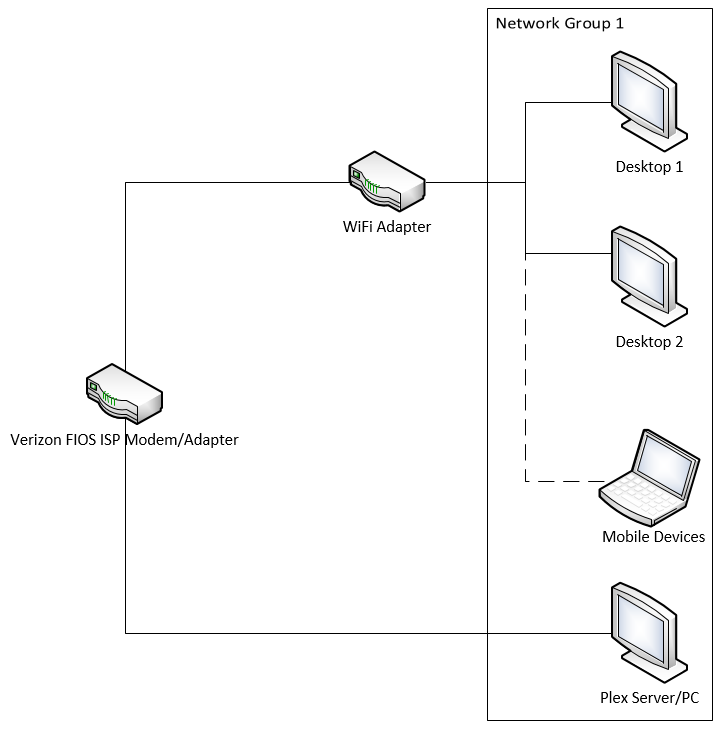 Is this network configuration possible? How do I prevent Wireless devices showing up as Wired devices on a 2-router-network? Wireless Covering a Two Story + Basement House? How to share a WiFi network between two WiFi routers?